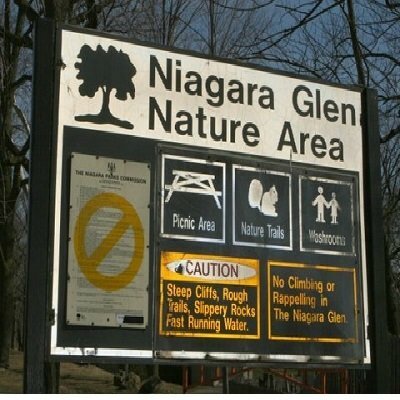 I just came across an article I had written 25 years ago about Niagara’s hidden pot of gold that I thought might be of interest. It’s believed there could be a pot of gold buried somewhere on the banks of the Niagara River in the lower Niagara Glen Nature Area north of the falls. The story goes like this…Gold had been sent from England on a ship to pay soldiers stationed at Queen’s Town (later renamed Queenston) during the War of 1812-14.The reputed treasure-$100.000 in gold coins- was stolen from the ship by two deserting soldiers. It was taken and secretly buried on a plateau we now call Foster’s Flats lying upstream from the town in the lower Niagara Glen. Old records that I have read say it was buried 30 feet from a large rock at the foot of an Oak tree, the roots of which were like a hen’s foot. Before you head out treasure hunting let me tell you, I have looked in the past for plateau and Oak tree without success. Perhaps erosion and the swift flowing Niagara River have already claimed this prize. When I was a child I went to Niagara Falls with my parents around 1972. I was in about 3rd grade. I recall standing at the waters edge and I looked down and saw a dark almost black wooden box about 18 inches wide by 10 inches deep and it seem to be at least 18 inches tall. The top was about 2 or 3 inches thick and it looked like there was some type of hinge on the back side. It was buried up to the edge of the lid. I wanted to look at it closer but a mouse ran across the waters edge and scared me. I never told my dad until years later when I was about 38 years old. My dad said I should have told him as it seemed interesting. To this day I think about that box.